"For this edition of Burn To Shine, we ended up in Portland, Oregon, and in the capable hands of Mr. Chris Funk and his partner Seann McKeel. Chris plays in the band The Decemberists, and Seann is a booking agent in town. We asked them to pick their favorite Portland bands and have them come out to a house we had found on the outskirts of town, where they had an hour to set up, sound check and play one song each in front of our cameras." The Burn to Shine series is an interesting musical project developed by Fugazi's Brendan Canty and filmmaker Christoph Green, of which this particular release is the third. Canty and Green select a town (in this case Portland, OR), pick a local "curator" that is part of the music scene and then film curator-selected bands performing in a house that is about to be demolished or burned to the ground. Per the introduction on this disc, the bands have an hour to set up, sound check and play one song live. The two earlier Burn to Shine's focused on Washington D.C. and Chicago, but for this Portland edition Canty and Green picked The Decemberists' Chris Funk and booking agent Seann McKeel as curators, and the resulting lineup musically paints in wide stripes of college-radio cool. 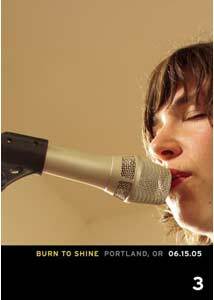 It's a true cross-section of area talent, with "name" artists like Sleater-Kinney (that's Carrie Brownstein on the cover), The Shins and naturally Funk's The Decemberists, as well as groups like The Thermals, Mirah and Quasi, all performing one song live in an empty, but very people-crowded house. There are no rambling press release intros, and each of the 11 bands just get a modest but stylish title card with their name and song title as a lead in. I can blather all day about the remarkable live version of The Decemberists' The Mariner's Revenge Song (a rousing sea chanty set in the belly of a whale), but probably the most jawdropping and revelatory moment here occurs during For All You Know by The Ready, a byproduct of Portland's Rock Camp For Girls. This is real-life School of Rock stuff, and when the camera pulls back that first time and you get a look at how young these girls are it is an initially incongruous visual. The song�driven by a bubbly synth bed and properly disenfranchised vocals�is actually a fine bit of alt pop, and the fact that the lead vocalist's guitar is almost bigger than her doesn't really seem to matter at that point. The Ready's inclusion here is not just a novelty touch, and they more than hold their own alongside the "older" acts. The disc concludes with footage of the house being purposely burned by the local fire department, and there is a strange sensation in watching a structure that just contained a stream of vital live music go up in smoke and flames. That's the art aspect of the Burn to Shine project, and as truly cornball as it may sound, the effect is mesmerizing, as if the music itself was some sort of ritualistic service performed as a set of last rites. Image Transfer Review: All hail to Trixie DVD on the transfer, with all performances presented in razor-sharp 1.78:1 anamorphic widescreen. This thing is really beautiful to look at, and the level of image clarity is really outstanding given the setting, so much so that as the cameras move around it is possible to pick out the tiniest of details on the performers. The color palette carries a dominant set of reds and browns, but fleshtones look consistently natural and lifelike. Audio Transfer Review: Audio is a 2.0 PCM mix, but don't let that spook you any. It's a particularly active mix, and the music comes across cleanly, with punchy bass and well-defined vocals. Instrumentation separation is equally precise, and it is possible to pick out the nuances of every drum fill or bass frill without having to strain your ears. Extras Review: Supplements are minimal, and include one additional performance, this time from Tom Heinl, doing a karoake-style version of his wacky Christmas Tree on Fire (02m:28s) as well as an automated slideshow (04m:47s) that features shots of the bands performing mixed in with a few candid photos. Interesting concept and execution, buttressed by a block of great performances, ranging from hip vets like Sleater-Kinney to the very, very young The Ready, who prove indelibly that Portland has very solid rock roots. I'm adding this to my year's best list, so it goes without saying that this one is highly recommended.